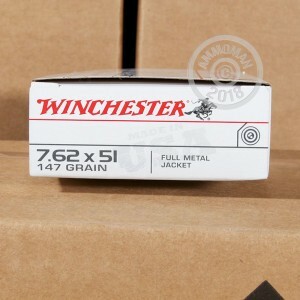 This 7.62x51mm NATO cartridge by Winchester sports a 147 grain projectile, the same weight as that is used in the M80 Ball variant of this round. 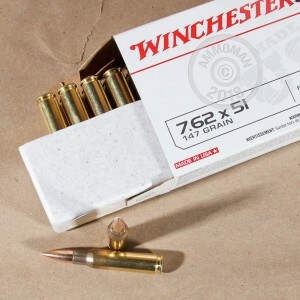 The bullet features a full metal jacket, which makes it able to penetrate targets -- it also reduces barrel fouling so you can enjoy more accurate shots at the range in between cleanings. 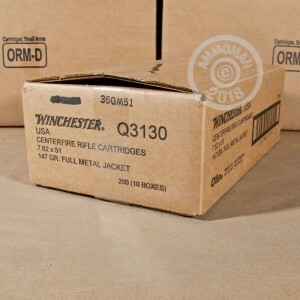 This round’s non-corrosive Boxer primer and factory fresh brass casing make it fit for handloading, so 200 of these ought to last you quite a long while if you know your way around a reloading bench. Founded a year after the end of the Civil War, Winchester’s legacy of innovation and quality has made their ammunition a trusted go-to in the shooting community. This high quality round is certain to serve your rifle admirably, however you choose to implement it.